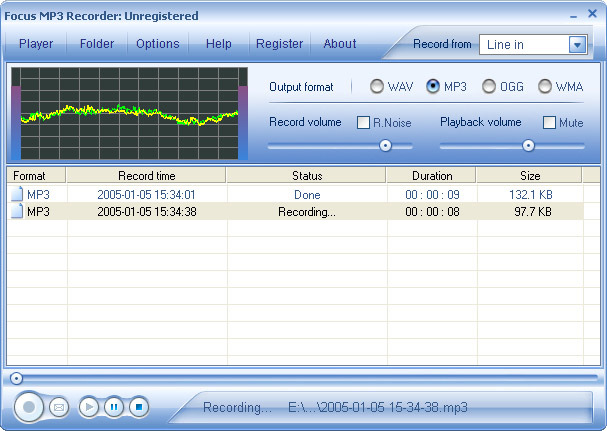 Focus MP3 Recorder Pro is an all in one audio software of MP3 recorder, player, splitter, joiner, CD burner and editor. With the splitter and joiner, you will be able to split audio files into smaller segments and join the necessary parts to get a new file. The editor can edit audio files as you desire by cutting, copying, pasting, and trimming, and with various DSP effects. And the schedules can be set as many as you like. Record from line-in (cassette, LPs, etc. ), streaming audio, microphone, game or any other source available on your system. You can convert: MP3->WMA/WAV/OGG; WMA->MP3/WAV/OGG; WAV->MP3/WMA/OGG; OGG->MP3/WMA/WAV. Advanced audio CD burning from WAV, MP3, WMA and OGG formats. Powerful, yet easy to use feature to burn CDs. Split or cut large audio file(MP3, WMA, WAV, OGG, etc.) to two or more smaller audio files. Merge or join different audio segments(MP3, WMA, WAV, OGG, etc.) into one file. The audio editor proves you a perfect edit on your files. You can select among the most popular editing commands, for example, amplify, fade in/out, normalize, insert silence and etc, as well as using the filters to get the best results. Qweas is providing links to Focus Mp3 Recorder Pro 4.0.0.0 as a courtesy, and makes no representations regarding Focus Mp3 Recorder Pro or any other applications or any information related thereto. Any questions, complaints or claims regarding this application Focus Mp3 Recorder Pro 4.0.0.0 must be directed to the appropriate software vendor. You may click the publisher link of Focus Mp3 Recorder Pro on the top of this page to get more details about the vendor.